It’s been a long while since I’ve purchased inkjet cartridges. I don’t print all that much and they only end up needing replacement every 12-16 months. In the past, it’s actually been cheaper to buy a new printer (since I generally buy the cheap, crappy ones and they don’t last very long). 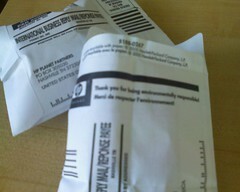 So I was pleasantly surprised when I received two postage-paid envelopes with my two-pack of cartridges to return the empty ones to HP for recycling. Considering the waste problems exacerbated by the influx of peripherals ending up in dumps this little move toward a bit of extra environmental consciousness made me almost (not quite, but almost) feel okay about forking over nearly $70 for the privilege of printing, and adding further volume to my recycling bin.